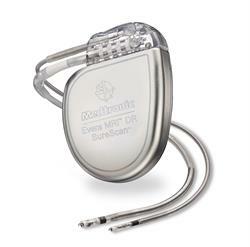 Medtronic has received Health Canada approval for its implantable cardioverter defibrillator (ICD) system for use with magnetic resonance imaging (MRI) scans. The Medtronic Evera MRI SureScan ICD system has been granted approval for MRI scans on any part of the body without positioning restrictions. According to Medtronic Canada, the newly licensed system includes the Evera MRI ICD and Sprint Quattro Secure MRI SureScan DF4 leads, which must be used together to be considered MRI conditional. The Evera MRI ICD system is comprised of hardware and software design enhancements from previous generation devices, which enable it to safely undergo full-body MRIs. It is paired with the Sprint Quattro Secure MRI SureScan DF4 leads, which provides active monitoring and tested for safe use in an MRI environment. The license was granted for the Evera MRI ICD system based on safety and efficacy data of the Evera MRI clinical trial. The multi-center, prospective, randomized and controlled clinical study enrolled 275 patients at 42 centers across the globe. Trial’s data showed that the Evera MRI ICD system is safe and effective when used as directed, while the full body MRI scans did not affect its ability to deliver life-saving therapy, said the firm. Medtronic Canada president Neil Fraser said: "The Evera MRI ICD system underwent comprehensive computer modeling of more than 2.3 million clinical scenarios and this information, combined with the safety data from the clinical trial, has resulted in this important regulatory license. "As pioneers in the development of implantable cardiac devices that can be used in an MRI environment, Medtronic is committed to ongoing innovation to address the clinical needs of physicians and patients." Image: Medtronic has obtained Health Canada license for an implantable cardioverter defibrillator (ICD) system for use with MRI) scans. Photo: courtesy of Marketwired L.P / Medtronic Canada.